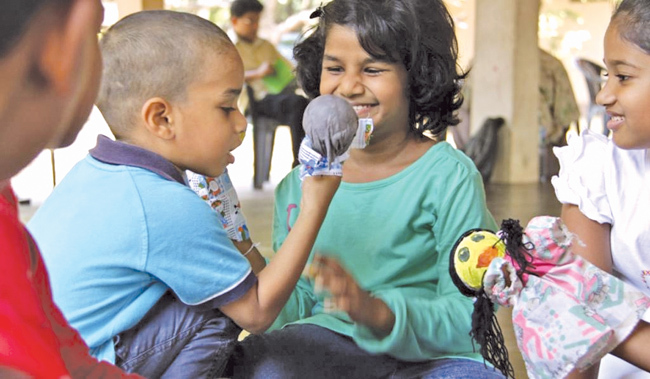 Lanka Children’s and Youth Theatre Foundation (LCYTF) or popularly known as Somalatha Subasinghe Play House commenced its session of “Creative Activities for Children” program on January 6. Children from ages four to fourteen can take part in the program. The prime objective of the program is to develop child’s mental and physical aspects and to enhance artistic taste, cheerfulness and playful sense of the child through aesthetic experiences. Therefore, this program can be considered as an extracurricular learning that supplements the formal education the child obtains in school. The program gives the child the opportunity to learn the basics of enjoying and appreciating music, free movement, dance and rhythmic movement, acting and language, art, singing, puppetry and handwork. The program is conducted by Kaushalya Fernando, Dr. Chandana Aluthge and Mayura Perera. The Late Somalatha Subasinghe founded Lanka Children’s and Youth Theatre Foundation in 1981 to promote theatre productions and performances specifically for children and youth, training of actors, and research on theatre studies. This organisation presently is the top most institution for children’s and youth theatre productions in Sri Lanka. Since 1981 the organisation has produced a repertoire of mainly musical theatre for children and youth and mainstream art theatre productions and performed them in the island as well as abroad. This institution was incorporated in the parliament in January 2007 under the Act of Lanka Children’s and Youth Theatre Foundation, No. 3 of 2007 to further its quest for the young audiences in Sri Lanka. This program is conducted on Saturdays from 9 a.m. to 11.30 p.m. at Battramulla Lion’s Club Activity Centre situated in Jayanthipura main road. For details send in a stamped envelop to the Coordinator, Lanka Children’s and Youth Theatre Foundation, No. 166/1, Buddhist Institute Avenue, Parliament Road, Kumbukgahaduwa, Kotte 10100. Details of the programme are also available on www.playhousekotte.org, and FB/playhousekotte.org. Are you keen to study drama? Are you hardworking and ambitious to become a competent theatre artiste? Then the Diploma of Acting program conducted by Lanka Children’s and Youth Theatre Foundation (LCYTF) or popularly known as Somalatha Subasinghe Play House is the right choice for you. The program entails all round training such as acting, script writing and analysis, directing, movement and vocal training. Over 35 years, Playhouse Kotte has been training numerous talented youth who are at present engaged in the work of both theatre and film industry at professional level in Sri Lanka. Somalatha Subasinghe Playhouse was established by Somalatha Subasinghe in 1981 and later it was incorporated in the parliament of Sri Lanka under LCYTF Act No 3 of 2007. The duration of the program is six months. Within the period, twenty-five in class sessions will be conducted on weekly basis. There will be one to two sessions per week mostly on Saturdays, Sundays or/and other public holidays. The primary focus of the course is on acting, directing, script writing and dance theatre. Thus, the participants will have the opportunity to learn free and structured movements, posture, body flexibility and physical balance, vocal training, pronunciation, voice projection, directing and script writing such as character analysis, improvisation, plotting scenes, etc. The program is primarily conducted by Kaushalya Fernando and Prasanna Mahagamage. Both of them are very experienced artistes in theatre training and teaching in Sri Lanka with international exposure. Other professional artistes from specialised fields will conduct sessions. Those who are willing to join the Program in Acting, primarily should possess a love for the theatre and should be prepared to offer her/his full commitment to the training and she/he should be hard working and ambitious. The candidates will be selected for the programme in an interview. The programme is scheduled to commence in early February 2018. Application and details of the program is available on www.playhousekotte.org or facebook/Playhousekotte.org. You could also write to The Coordinator, Somalatha Subasinghe Play House, 166/1, Parliament Road, Kumbukgahaduwa, Kotte 10100.